The rock art of India. Dr Jean Clottes & Dr Meenakshi Dubey Pathak, explore the vast concentration of ancient rock paintings found in shelters and sites all over India. Dr Jean Clottes study of the Rock Art of Central India made during his archaeology field trips to the Rock Art sites in Madhya Pradesh, the state with most rock art in India. Dr. Dubey Pathak's extensive research of the Pachmarhi Hills brings to light the prehistoric rock art of India and also highlights the drastic need for preservation. This gallery section of the Bradshaw Foundation India Rock Art Archive consists of a series of photographs taken at numerous petroglyph rock art sites found in Central India. Dr Meenakshi Dubey Pathak's contemporary art inspired by the rock art and petroglyphs of India; working on canvas, tree bark, stone, glass, and fabric. One of the most effective tools of preservation of rock art is education, Dr Meenakshi Dubey Pathak works with local tribes in order to understand their culture. 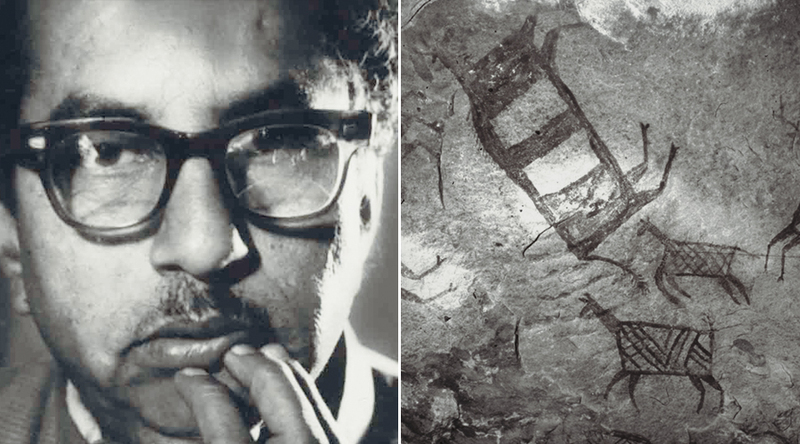 Distinguished archaeologist Dr. V. S. Wakankar who revealed to the world the painted rock art Shelters of Bhimbetka in India, inscribed in 1970 as a UNESCO World Heritage Site. In a series of archaeology articles for the Bradshaw Foundation, artist and researcher Dr Meenakshi Dubey Pathak explores the wonderful and precious cultural heritage of India. Ancient rock art & cave paintings from around the world at the Bradshaw Foundation archive, dedicated to the study, research & preservation of early mankind’s artistic achievements.